Welcome to grams to cups. On this website we show you everything about changing the mass (m) in g to the volume (V) in cups, a unit of measurement used in cooking to measure both liquids, as well as dry stuff. The grams to cups conversion can be made using the formula V = m / ρ with ρ (rho) being the density. Each ingredient has a characteristic density in function of pressure and temperature. Luckily, almost all measuring cups are calibrated in weights of common dry ingredients such as flour and sugar as well as in cups. Yet, the unit cup can mean legal, customary, imperial or Canadian cup, depending on where you live or where the piece of plastic has been produced. Naturally, all these cups have a different equivalent in milliliters. Read on below to learn how to convert grams to cups. Measured in g /cm3 ⇔ g/ml, water has a density very close to 1 at sea level and 39.2 degrees Fahrenheit. In cooking, we can therefore assume ρ = 1 and get V = m, that is the volume in milliliters equals the weight in grams. But what about flour and sugar for example? Generally speaking, we have to know the density of the substance we want to convert from grams into cups, as well as the cup size. Different kinds or qualities of the same ingredient don’t have the same density. Thus, unless we know the exact density for a substance, we should convert grams into cups using the average value for a range. Cups = m / (ρ * Cup size). For this grams to cups formula, the value for rho (ρ) has to be in grams per cube cm or grams per ml. 100 g / (0.911 g/ml * 240 ml) ≈ 0.46 legal cups. Our grams to cups converter below can do the calculation for you. The first calculator does the math for any material with known value for rho. In turn, the second converter can be used to calculate common ingredients for which we use average densities. You can do the gram to cup conversion the way which is more convenient for you. If these tools have been helpful to you save create a bookmark and save it as conversion grams to cups, or grams in cups. Here you can find cups to grams. To convert grams to cups we recommend you use our calculators instead of the equation. If you are using our converter with ingredients, then keep in mind that the grams to cup results are approximations. If you don’t know which cup you have, the difference between legal and US customary cups is only 1.4 %. Visitors from Canada searching for how many cups in a gram should note that there are cases when plastic cups sold in retail are in fact US cups of 240 ml; the Canadian Cup is not so widely used. These days, the same is true for imperial cups. 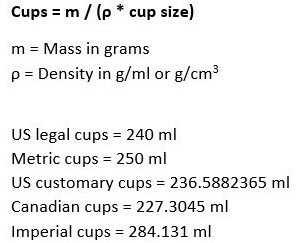 If your household is located in a country belonging to the Commonwealth of Nations, chances are that a cup means 250 milliliters called a metric cup. The image below sums it all up. We have made this website to help you with the question how many g in a cup because recipes can refer to cups of varying volume. Moreover, converting grams to cups depends on both, the density of the material as well as the size of the cup. If you have any questions about grams into cups then leave a comment. If this article has been useful to you then please like it and tell the other chefs about our grams to cup conversion. Thanks for visiting gramstocups.net. grams to Cups 750gms = how many cups?